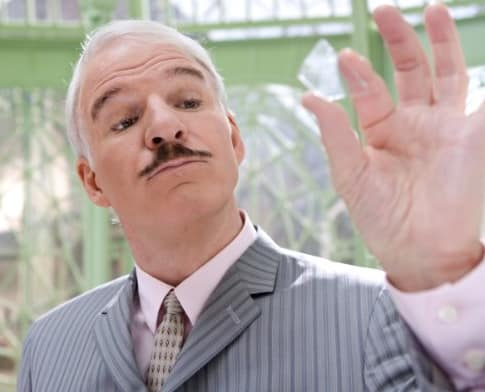 Here's the saddest thing about The Pink Panther 2: we know Steve Martin can be funny. The comedian recently completed a hilarious guest-starring turn on 30 Rock. Therefore, it's extra frustrating that he stoops to levels required bu Jacques Clouseau in this sequel to an original that wasn't very humorous to begin with. Emily Mortimer and Jean Reno return; John Cleese replaces Kevin Kline as Inspector Dreyfus; Alfred Molina and Andy Garcia come aboard as international investigators; and Bollywood star Aishwarya Rai even makes an appearance. Still, these stars combine to produce a dull, obvious movie. The occasional pratfall might be acceptable, if only it was surrounded by anything resembling wit or coherence. As Martin's 30 Rock appearance proved, less is more for this actor. We hope he gets the message and sticks to subtle, sarcastic roles in the future... as opposed to dressing up like The Pope and hanging from a balcony.